At the IAHE Conference (Indiana Association of Home Educators), I taught four workshops. While they were all well-attended and well-received, one of the sessions sparked an emotional reaction like none other. My brain training session was the last on my schedule and one of the last of the weekend. I fully expected a low turnout and glazed-over eyes from those few. To my shock, the room was packed to the brim with eager participants. Some of them, I later found out, almost desperate for information to help their struggling students. Because of the immense response I had to the topic of brain training at IAHE (and elsewhere), I’m going to write a BRIEF summary of that workshop and provide you a short list of materials that can help train brains. Please understand that a post like this only scratches the surface of the topic. The easier definition: Brain training consists of targeted exercises that change the brain’s capacity to think and learn. Picture muscle building and endurance training for the brain. The slightly more technical definition: Brain training builds neural pathways – meaning new “connections” are made in the brain allowing for better cognitive skills. Cognitive skills include attention, memory, processing, comprehension and logical understanding. Cognitive skills, otherwise known as executive functioning skills, have to do with the process of how we learn rather than what we learn. For example, in order to learn anything well, we really must be able to focus our attention AND process and comprehend the material AND place it in our memory. Some people struggle with one or more of these cognitive skills, meaning learning might be harder than it should. Brain training exercises help build cognitive skills! Surprisingly, brain training is not only great for those with obvious cognitive skill deficits, but can be useful for anyone wanting to unlock more potential! So, just about anyone can benefit from the exercises – those with ADHD tendencies, learning disabilities and brain injuries. Brain training even helps students who struggle with test anxiety or just want to take their test taking skills from good to better. How to Train Cognitive Skills? Most experts say brain training exercises work best when practiced 5 days per week for 8-12 weeks. In the training I received to work with my own children, I learned each day should consist of at least a few of the primitive reflex exercises (see below) and some of the cognitive skills activities (also see below) for a total of about an hour. Much of the research would suggest brain training should begin with exercises to strengthen the primitive reflexes. These are reflexes that originate from the central nervous system and are typically “integrated” (or become natural to us) soon after birth. Sometimes, though, because of various stressors, one or more of the reflexes is not integrated and can wreak havoc. The good news is the integration exercises are easy. In our family, we use the eight exercises demonstrated by Whatif244 on YouTube. 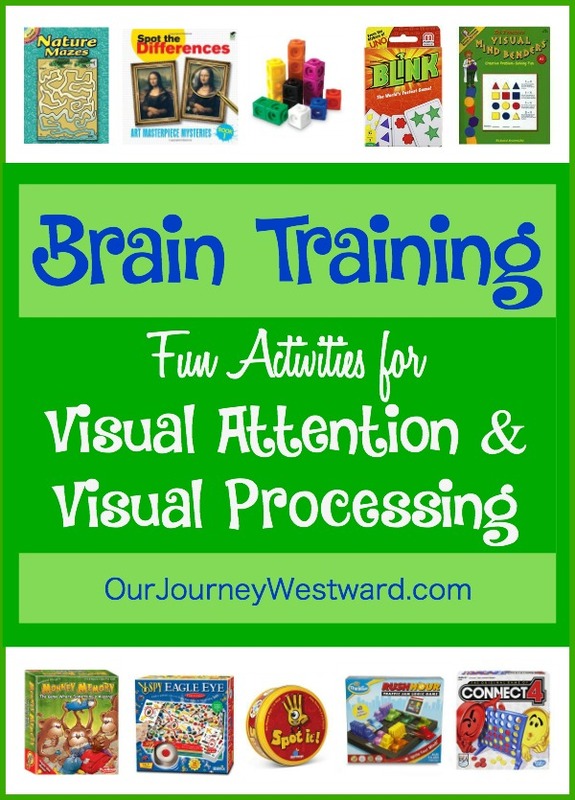 Oh, there are so very many activities you can use to train the cognitive skills. I’m only able to give you a small glimpse into the possibilities by providing a few examples in this post. Check back often, though! I will write more in depth posts for each of the cognitive skills and link to them at the bottom of this post. 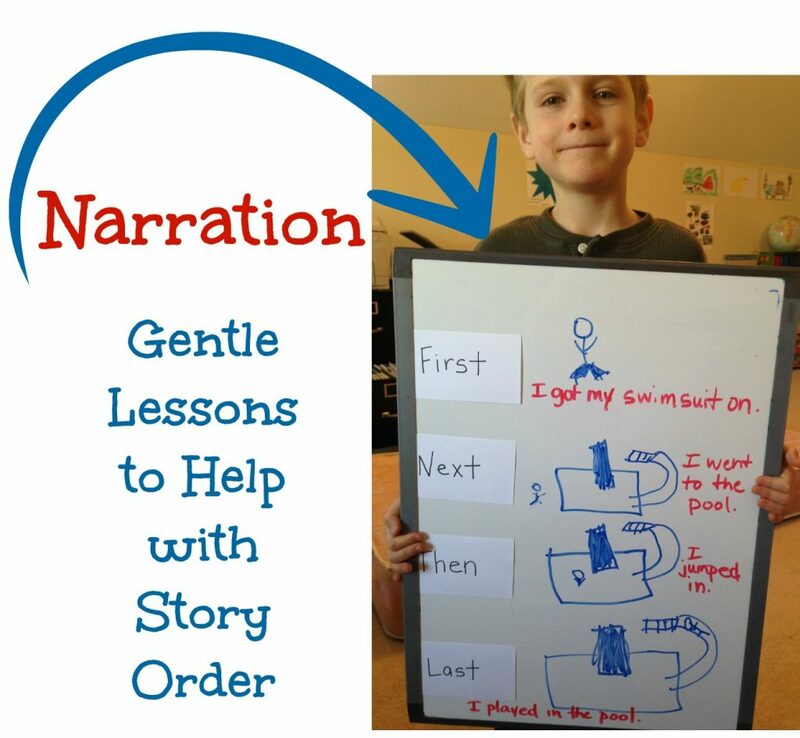 Here’s some REALLY good news about cognitive skills activities…they’re FUN! In fact, the activities are so fun, we call them brain training games at our house. While not all cognitive skills activities utilize card and board games like I’m mentioning below, these are the easiest for me to suggest in the confines of this post – and they’re the easiest for you to pick up and use as the parent. These inexpensive card games are perfect for practicing A LOT of cognitive skills: visual, divided, and flexible attention; working memory; processing speed and visual processing. These very hands-on games practice A LOT of cognitive skills as well: visual and flexible attention; working memory; visual processing; and logical understanding. Good old-fashioned memory games pack way more punch than you ever realized: visual, divided and flexible attention; short-term and working memory; visual processing; and logical understanding. I’ve been telling you the benefit of adding logic to your schedule for years. Besides logical understanding, comprehension is also covered quite well within logic puzzles. Which cognitive skills to practice? Many times, you can look through the list of cognitive skills listed above and easily pinpoint which skills are most lacking in your children. If not, this free Executive Functioning 101 ebook can help you determine your child’s cognitive weaknesses. For children with moderate to severe learning disabilities and/or attention struggles, it’s probably best to let the trained professionals work their magic with brain training activities that are highly targeted and implemented systematically. Brain training centers are available all over the U.S. under various names. 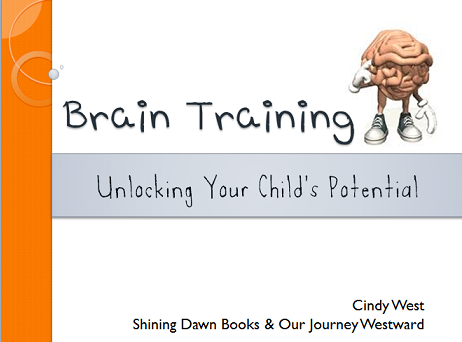 One of my favorite workshops to present to homeschooling groups is my brain training workshop! 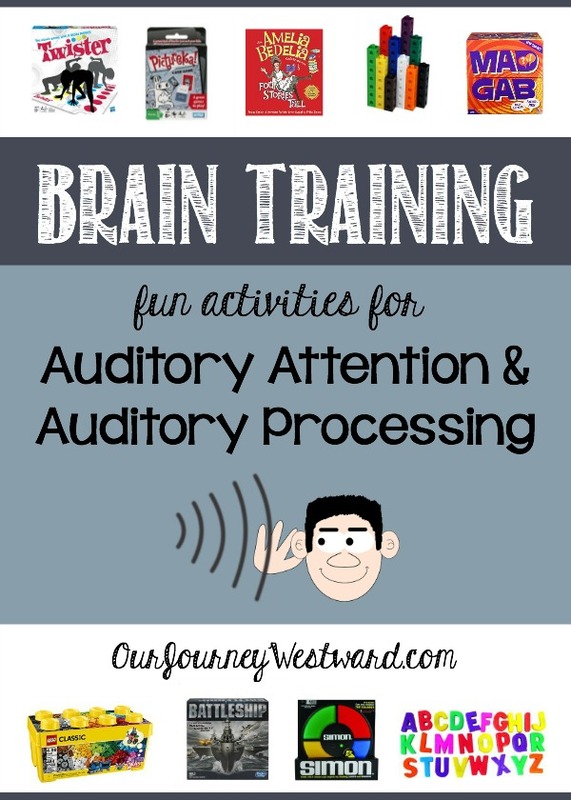 In a very hands-on hour, I share a nice overview to help you learn more about the power of brain training and send you home with some practical ideas. 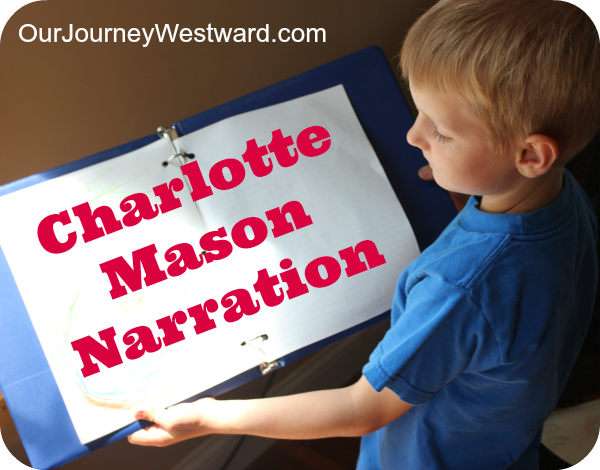 Hear my Homeschool Snapshots interview about brain training! I’m just a mom who’s used these principles, games and exercises to make a difference in the memory and attention of her children. I cannot promise the same results in your children. I have only minimal training in special needs. I hold a master’s degree in elementary education, but do not hold degrees in special education, psychology or occupational therapy. Consistent brain training has made a huge impact in our home! The activities have improved some learning struggles, attention struggles, follow-through struggles and general self-esteem issues. And, continuing to complete at least one activity daily to fire up the neurons before school has had crazy wonderful results. Brain training has been big for us, y’all. I love this! We’ve used memory work to train our brains and it’s amazing how the skill of memorizing begets greater memory. I love the variety of ways you offer above. I can’t wait to try out some of the games you mentioned above. Thanks so much!